1.Alcohol recycling: Strong recycling capacity and the vacuum concentration procedure, make the production rate improved 5-10 times than the old types, and reduced 30% of energy cost. It has the character that little investment but high reclamation profit. 2.Concentrating materials: The equipment adopts the style that combining externall heating cycling and vacuum negative pressure evaporation. Evaporation speed is swift, and the concentration proportion can reach to 1.3.The liquid materials are concentrated under he completely sealing condition and there is no foaming. 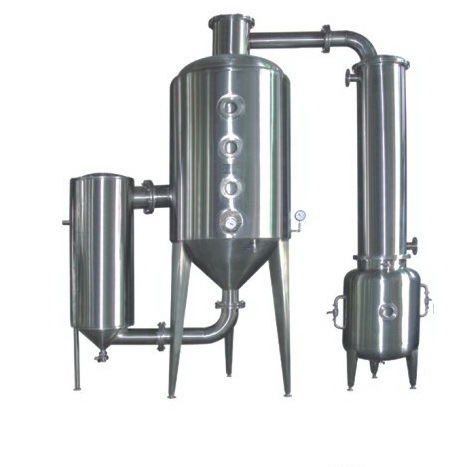 The liquid concentrated by this equipment has the features that no pollution and strong flavor. And it is easy to clean (cleaning can be done as soon as opening the upper and lower covers ). The machine is easy to operate, covers small areas, the heater and vaporizer adopt the stainless steel heat keeping structure, and the surface is mirror or matted process.